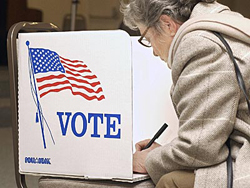 On Tuesday August 23, Oklahoma voters in 58 counties headed to the polls to vote for the primary runoff elections. These elections determined several nominees for legislative and congressional seats in the November 8 general election. Oklahoma is one of seven states that uses the primary runoff system. When no candidate wins 50 percent of the vote in the initial primary, the top two candidates move on to a runoff election. Voter turnout for runoff elections is often much lower than primary elections, meaning the vote is determined by a small electorate. Information from the State Election Board showed that average voter turnout for the 2014 runoff elections was just 18.1 percent. The final turnout numbers for this year’s runoff election are expected to be similarly low. When elections have low voter turnout, the results of the elections are left to the small number of people who voted. Though our election system works under a democracy, when the people do not vote, a minority of the majority rules in. In early reports of Tuesday’s runoff election, it appeared Al McAffrey had won against opponent Tom Guild by only 40 votes in United States Representatives District 5. A sentiment often held by discouraged voters includes the idea that “your vote doesn’t matter”. In the case of local elections like this, the difference between 40 people being motivated to get out and vote can be vital. Al McAffrey will now face Republican incumbent Steve Russell on November 8 in the general election. If McAffrey wins the position, those 40 votes will have been incredibly important determinants in his ability to progress that far. In a historic close-call during the 2006 primary elections, Republican Todd Thomsen defeated Democrat Darrel Nemecek by only two votes for the Oklahoma House of Representatives seat in District 25. Our votes in local elections suggest that the candidate who gets the most votes has a higher competency, quality, and ability to represent their constituents than an alternate candidate. When votes come down to such small numbers, our candidates are selected by a miniscule pool of voters. Sharon Vaughan, Ph.D., a political science professor at Oklahoma City Community College, said voters are often disconected with the election. “We see in political science that most people that vote are usually white, more afluent and older. That shows that the general population, especially millennials, are not represented at all by the public choices that are made,” Vaughan said. Vaughan’s comments are not just conjecture, but based on fact. The United States Elections Project shows that the majority of older individuals turnout much more reliably than millennials in presidential elections. This data comes from the Census Bureau’s Current Population Survey. Come November 8, over half a dozen important state questions will be on the ballot, as well as varying congressional and legislative seats depending on the district. “I’ve worked voting days just to see what it’s like and I’ve always had some people come in and say, ‘I just want to vote for the president I don’t want to do this other stuff’, when there’s other stuff on the ballot they don’t even want to do it,” Vaughan said. That kind of mentality is devastating to our democracy in statewide elections. Some of the state questions will include decisions on execution methods for prisoners, constitutional guarantees for farmers, sales tax increases for education funding, allowing public money to be spent for religious purposes, and potentially medical marijuana legalization. The outcomes of these questions will affect major parts of our lives as Oklahomans, and it all comes down to who will get out and vote “yes” or “no”. Individuals who claim that voting is ineffective or “not worth the time” perpetuate a dissatisfaction with “the way things are.” In our current election system, elections are held frequently and often throughout election years. It takes active participation in the voting process for our democracy to work the way it should – for the people, by the people. If more individuals participate in civic matters, an avenue for local and community representation is made accessible. Procedures and requirements to run for office can be found on the Oklahoma State Election board website. Come November 8, be ready with your driver’s license, a photo ID issued by the Oklahoma or US government, a military ID, or your county election board voter ID. You are allowed under Oklahoma law to take up to two hours paid time off work in order to vote if your shifts start earlier than 10 a.m. or ends later than 4 p.m. Your vote matters – so make sure you plan ahead of time to find when and where you can vote in the general election. You can visit votesmart.org to read about the positions of candidates that will be on the November 8 ballot. You can find out if you’re eligible to vote by going to canivote.org.